We're here to help you buy dive gear on-line and in-store! The Scuba Doctor has always been a favourite dive shop with Melbourne divers and it's now recognised as one of the nation's best loved online dive stores. We are always looking for ways to improve your dive shop experience both online and in-store. We use the latest technology to provide you with the most detailed product information. Our resident scuba experts provide the information to allow you to make an informed decision from the comfort of your home. And if you need more information, we're just a phone call, email, or an in-store visit away. We're a small, friendly operation located in Rye, on the Mornington Peninsula, south of Melbourne in Victoria, Australia. This is where our dive store and warehouse is located, and the service and repair centre is just next door. So make sure you pay us a visit if you're in the area, we'll be sure you make you welcome! 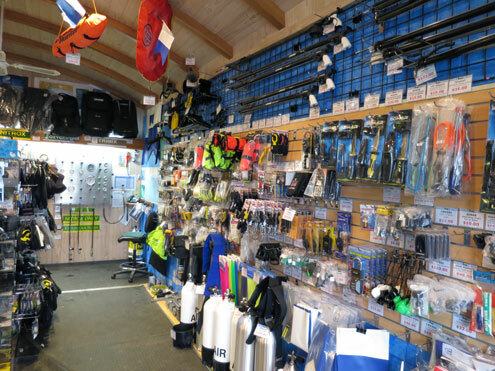 Our dive store is our pride and joy. You can get your dive cylinders refilled by one of our scuba experts in the dive shop whilst you wait. Plus we stock a huge range of items from the leading dive brands plus selected niche manufacturers, to make sure you have access to all the best sport, technical, commercial, military and public safety diving equipment. Our online dive shop serves Australia's scuba fanatics, supplying them with the best diving kit to keep them safe, whilst exploring the wonders of the oceans. We know how much divers love Underwater Photography and Video, so we have some excellent camera equipment in store for action cameras (e.g. GoPro and Intova), compact cameras, and full-frame cameras. Plus we have stuff for Free Diving and Spearfishing, Snorkelling, Swimming and Watersports enthusiasts.